If you already own a home or business, now could be the perfect time to buy your first investment property. The TV shows make it look easy and exciting, and with the right team by your side, it is! But there’s a lot to consider when you’re ready to purchase a home or commercial building as an investment property, especially if you’ve never done it before. It’s about more than a just smooth transaction; it’s also about a smart buy. Dream Builders Realty and dbrCommercial are here to help. Our residential and commercial divisions have all the bases covered in Central Florida—from vacation homes to undeveloped land to everything in between. Our associates and research teams are equipped to help you through the process every step of the way. 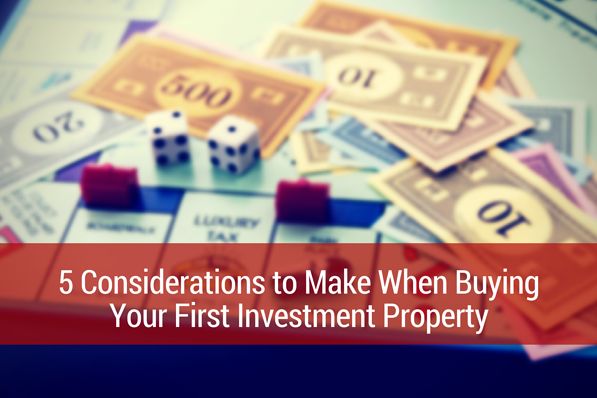 Here are five things to consider when buying your first investment property. If you’re in debt with no savings, now isn’t the right time to invest in property. Instead, make a plan (perhaps meet with a financial adviser) to improve your bottom line. Start by making a budget, paying off outstanding bills, and opening a savings account. If you are financially healthy, crunch the numbers and only buy what you can comfortably afford. Remember you’ll have to pay annual property taxes, collect sales tax on rental income (on a commercial property), and deal with other applicable taxes and government fees. We can help you research and understand what you’ll owe and when. Not properly understanding and planning for the taxes associated with such an investment can lead to challenges down the road – including having a lien placed on your property. What’s more, having the proper insurance and understanding what is and isn’t covered is extremely important. Being a landlord is different from being a homeowner, and the insurance policies and coverages for both are different, too. Will you look after the property yourself or hire a professional management company? The latter obviously will cost you, but the convenience and reduction of risk (and headaches) is worth it for most and necessary for those who live out of the area. If you take the landlord path, be prepared to do much more than just collect rent every month. The good news is you don’t have to go it alone. A competent property management firm will help you overcome common pitfalls and help you safeguard your investment, thus increasing your return on investment (ROI). After all, the ROI is what it is all about to begin with. Check out our Property Management 101 for more tips. Investing is about helping secure your future, right? Keep this sentiment in mind and establish a contingency fund for unexpected and emergency expenses. Whether it’s general maintenance, damage caused by renters, or a natural disaster, be ready for the unexpected expenditures of a rental property… they’ll arise sooner or later. It’s important to regularly set aside money for emergencies. Plan for the unexpected so you don’t get caught off-guard! The Sunshine State is an excellent location to invest in real estate. People want to move here, vacation here, and do business here. Florida has low property taxes, no state income tax, year-round sunshine, and a constant flow of newcomers. Central Florida, in particular, is one of the fastest growing regions in the U.S. Buying long-term rental property, vacation units, or commercial buildings in Central Florida is a good investment and something you should be considering sooner rather than later. Dream Builders Realty and dbrCommercial are ready to make your investment goals a reality. Your first foray into owning rental property should be a prosperous one. Let us help you invest in your future.